Note: This is an In the Hoop project, which requires an embroidery machine. 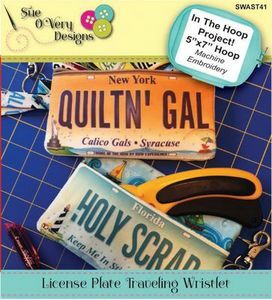 Travel in style with your trendy License Plate Traveling Wristlet. This sewing pattern is easy and fun. 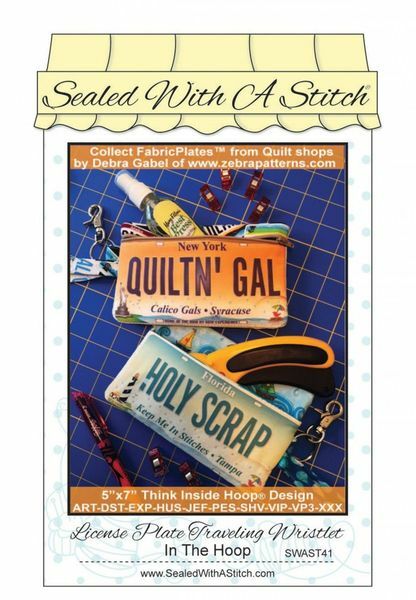 Collect these FabricPlates, during the Row by Row Experience in the Summer at different participating shops. Then stitch up a snazy traveling wristlet to show off where you have been! Inside holds ID or credit cards, outside is a handle and loop for swivel hook. Shown using three FabricPlates by Debra Gabel. In the Hoop zipper bag with some sewing machine sewing required. Approximate finished: measurement are 8"x5" tall.